I am new to .223 reloading and over the months have lucked into a bunch of good powders - AR Comp, CFE 223, 8208XBR, Varget, TAC. I tried the OCW route but. I've been handicapped by only having iron sights at this time. I have a 1-8X on order to help get some better marksmanship than my eyes and irons can provide. But time is wasting and I need to change my S1050 over to load some other calibers. So while I have proper OCW loads ready to go when I get my scope I want to make some respectable plinking ammo. I have 8 pounds of CFE on hand and I want to go to town with the S1050. I've fired up CFE loads between 23.2 to 24.4 (over max) without signs of pressure just really couldn't see a load that stood out as consistent. Anyone have nodes for 68 grain Hornaday HPBTs? Can't help you with CFE but my WOA 20" 1/7 shoots 1/2 MOA with IMR4895 22.9gn CC 77 Tula SRM 2.260. Maybe your Varget might do better or something a tad slower than the CFE but that is just a guess. Lee FCD set to not quite close all the way. This load shoots .5MOA from both barrels. Velocity is a little over 2700fps and 2600fps respectively. I had been getting 1MOA and 100fps slower by seating at 2.26" and using a Redding taper crimp. But shortening to 2.245" and using the Lee FCD gave BIG improvements. I got my hands on some red box Black Hills 77gr OTM. That stuff is loaded with pixie dust. Accuracy was great - although not necessarily any better than my handloads above. But the amazing part was the velocity. 2750fps from the 18" DD barrel and 2850 out of the Krieger! That's fully 150fps more than my 24.0 Varget loads above. Does anyone have any field data for the Nosler 64gr Bonded Performance and a 14.5" barrel? Preferably a .223 Wylde chamber. Hey gents, I plan on rebarreling my 223 12T to a 8T 26" Kreiger and wondering on MV for the 75gr and 80gr projies with H4895 and Varget. I plan on using 80.5gr Bergers for 300-600yd F-Class and the 75gr Amax for longer shots on varmints and steel. Are you going with a twist in the 1:7-1:7.7 range? I'm guessing that's the twist you'll need to stabilize those bullets. I'm thinking when you work up a load the accuracy node will dictate your velocity. Max load probably won't be the most accurate. Sounds like a great project please post the results. I see max loads with both both powders & 75 grain Hornady exceed 2900 but no telling where the pressure signs will be at with your rifle. Start low and build up in increments watching for pressure signs. ETA: I have a note from the reloading forums that reads: "The75gr. Hornady's shoot best between 2750-2800 fps, adjust mv accordingly to find accuracy node". Ill be running an 8T barrel. I dont usually like running max loads and I always choose to run the most accurate so if thats at 2800 then thats fine. I know every barrel is different so will see how I go. Sub .5 moa hammer load! 75 bthp seated at 2.245-2.248"
Load hammers in Wylde chambered WOA ADCO SPR barrels and Rainier Ultra Match barrels. Wish I would have seen this sooner. I have tested these bullets with 8208XBR and have seen very good accuracy with them. XBR isn't the best powder for these bullets if going for speed, but it works great since it is very temp insensitive. Out of my 14.5" barrels with 5.56 chambers, I see .75moa, 2680fps, SD 9 with 24.5gr XBR. 25.0 gives .75moa groups at 2750ish, but the SD is up in the 30's and 40's. The Winchester Ranger loading of this projectile (RA556B) is on par with green tip as far as speed: around 2900fps and around 3moa from 14.5's. CFE223 supposedly gave Nosler the best speed and accuracy, but I have yet to use any of that powder. Wouldn't the node depend on the combination of a particular rifle/load combination and not just the load? 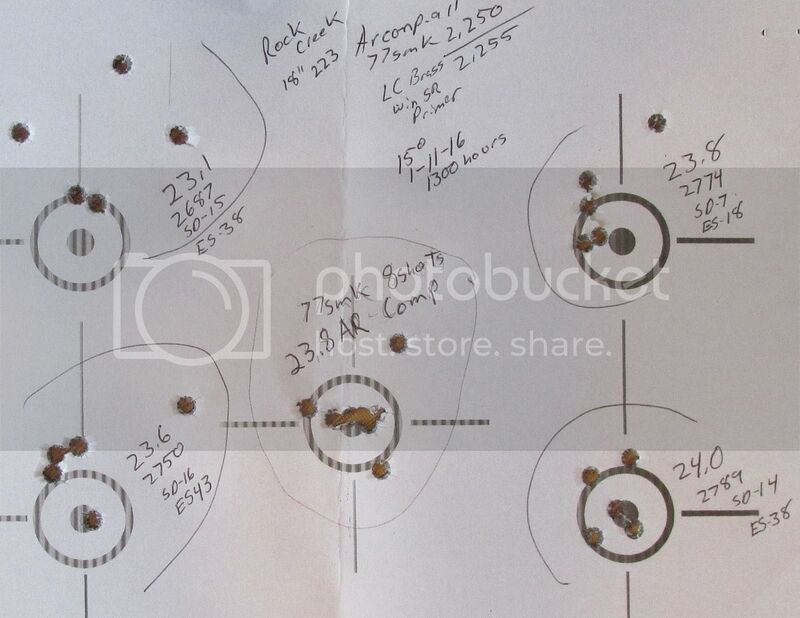 Group size = 5 shots 1/2 to 5/8 MOA. This is a solid 100fps gain over my 24gr load of Varget. And the accuracy may be better with TAC, which is a bit of a surprise to me. I need a jug of Ramshot TAC. Anyone know where any is - that's not $275 delivered? Any idea how long your brass is lasting with 23.8? 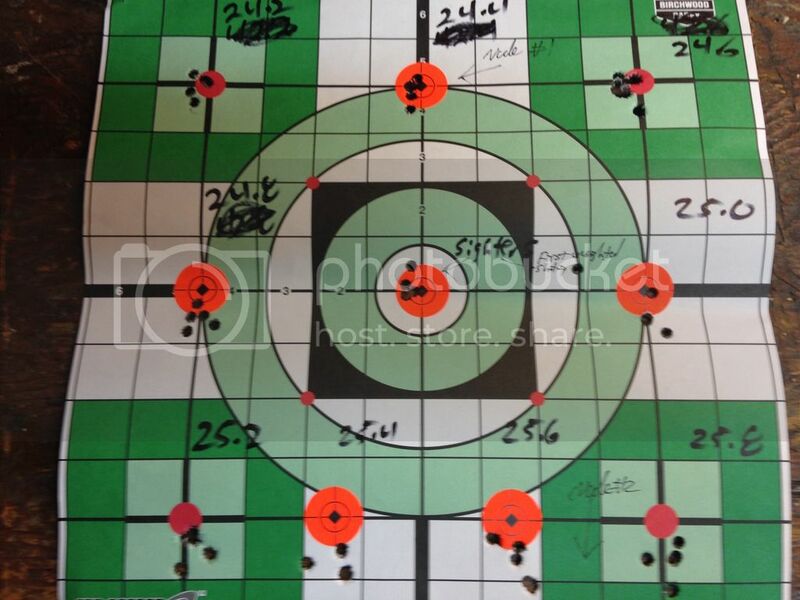 To be honest, I ended up stepping back down to 23.5gr 8208XBR after doing a number of comparison groups between it and 23.8; both were easily sub-MOA but the 23.5gr load seemed a hair better in my rifle. I've got a lot of RP brass that has 5 firings through the AR (and at least 2 through a Savage before that) so brass life isn't too bad, although resistance when seating primers isn't quite what it used to be. 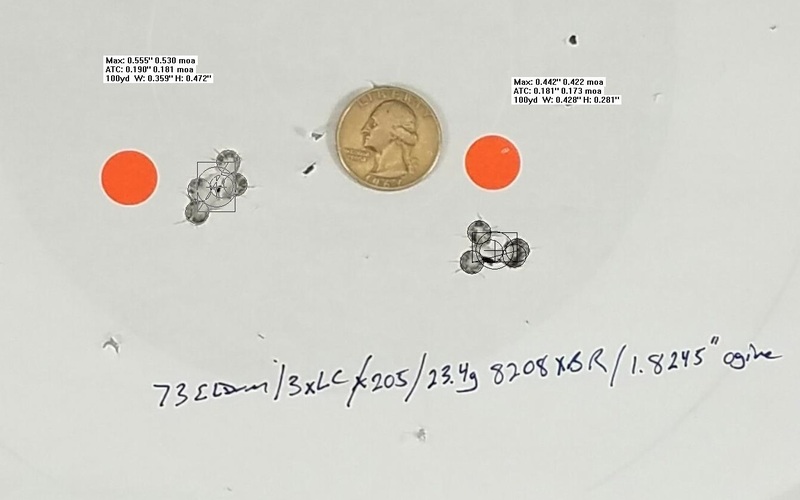 The 23.5gr load was consistently 2670fps over my ProChrono in 2013, but when I shot the 23.5gr load a couple months ago out to 650yd, truing the velocity using drops at 300 and 650 it was doing 2740. That seemed way fast, but I checked the math numerous times and its what I came up with. I've probably got close to 1000rd on this barrel now so maybe it sped up a bit, but it'd be nice to run the thing across a Magnetospeed and see for certain. I'll give 23.5 a try when I speed test 23.8... I was pretty pumped about the groups as I am not much of a AR shooter or shall I say I don't shoot them as well as I do a bolt. I'll let you all know what my magnetospeed comes up with. 18" noveske with 8208, 77cc @2.257" Winchester cases and primers. Thanks for the speed report, Niles! 24.3 varget, hornady brass .5 min @ 200 out 25 inch barrel Moon bolt gun. The hornady brass has less volumn than the lake city brass I used in past. Due to the long hornady 68 they are almost as long as Sierra 77. It is a almost compressed load. 2940 FPS out of a 20" Tikka T3 Tactical. Mixed brass all trimmed to 1.750"
No velocity data but produced average groups of about .400" at 100 yards out of a Rem 700 1-12" twist in an AICS. 69SMK 25.5 w748 #450 LC brass. 75/77 23.4 8208XBR #450 LC brass. These two loads south a bit of OAL adjusting seem to work in most rifles pretty damn well. Anyone have data for Alliant 1200-R? Platform would be semi-auto carbine, 55 grain projectiles. Usage would be plinking/carbine class etc. AR-15 20" Shilen, 1-8, Wylde chamber. Hornady 75 BTHP, Hornady brass, 26.0 CFE223, 2.260"
This load gives me avg. vel. of 3067 fps and an SD of 8 out of a 1/9 22" factory tube. Awesome load but will flatten primers for me, be careful. mild pressure and outstanding accuracy! Note: I loaded these with range brass that was only resized and not trimmed. Consistantly shot 1/4" 5 shot groups at 100 yards. Powder threw very consistant so once I set the throw and confirmed throw consistancy, I just threw the powder with out trickling up like I normally do with Varget. 9SMK 25.5 w748 #450 LC brass. 5 shot average - 2862fps. 10 shots into 0.7" @ 100yd, 7 shots into 0.4", hammer on steel @ 370yd. 5 shot average - 2915fps. First four shots into 0.25", shanked the 5th shot under pressure opening this up to 0.62". <span style="text-decoration: underline">75gr A-Max seems to shoot well from my 1:9 barrel</span>, but future 300yd testing will verify. WOA 18" SPR bbl 1/7 wylde chamber with Tubbs carrier weight system installed in the BCG. It's a tack driver in every AR I've tried it in and hits coyotes and prarie dogs like thor's hammer. These shot 1/2 MOA with ease. I've got 400 remaining and I'm going to load these up for very cheap trigger time. Got 1k Nosler 69gr CC's in the email (over-runs) and am going to see how well these shoot in the coming weeks. F/L resized brass, I prefer PPU. The above loads work well as a generic loads in 4 rifles, CMMG 16 Bull WASP, Mossberg 20" MVP Predator, 24" Savage 11VT, 24" Stag Model 6 Super Varminter. The slowest rifling is the CMMG 16"/1:9". F/L resized brass, I prefer Win. Thus load works well in my M70 Push Feed Sporter (under 2" at 250yd), 22" Savage Axis II XP, and should be fine in my Garand. My generic deer hunting load substitutes the SRA 165SGKwith no other changes. ETA: as of yesterday's test, the165SGK load shoots ay least as accurately at 200yd in my M70 sporter as the 168SMK load. It is not my policy to load beyond mag length and my brass is F/L resized to match a standard case gauge, and not any specific chamber. Update: the 165gr version of the '06 load placed first in local club (Bath, NY) deer rifle match. Sub 1/2 moa if I play the role of a shooter. 2.252 COAL- This bullet is more finicky than SMK's, tried 2.248-2.260 .252 was noticeably better. Mild load, 2855 Avg from my Tikka Varmint 24"
I've only shot 3 Groups (of 5) so far, but looks promising. All three groups under .5"
No real pressure signs yet. I may push it up a bit, but the accuracy is incredible so far. [HR][/HR]A good load for under 500 is 40grvmax on top of 24gr N120 and Rem 7 1/2. This is a max or near max load but it does a number on Prairie dogs. Factory Remington 700 SPS Tactical 1:9 20"
Bullet just touching the lands. Shoots .4s in my rifle. 24.7 shot even tighter with .3s, but the ES and SD were not as consistent. I will be testing 24.7 more. 18" FN chrome lined barrel, rifle gas, with 8208, 77cc @2.257" Wolf Gold cases and Winchester primers. LC Brass, headspace 1.460 (like FGMM in the box), trimmed to 1.750"
This load is 1/2MOA in three different DD CHF S2W 18" AR15 barrels. [HR][/HR]POF 16" barrel 1/8 twist. 2950 fps avg. for 10 shot string. I only shot this @ 50 yd. , I was looking more for velocity than accuracy. not to rain on anyones parade... I was looking over some of the loads copied over from the old site that are here and I see a problem. I'm a bit concerned that some of the data is messed up. I don't want to see anyone using the data with bad or even just poor results. I especially don't want my name tied to something that is wrong. I suggest that others look through this and see if I am the only one with bad data. Starting to load for my .223/.556. Trying to find a powder to start with. Gonna measure the twist tonight(Windham). Stock gun. Thinking of 55-62 grain bullets. Sounds like Benchmark, H4895, and Varget? I'll dig more, just looking for good opinions. Sounds like I may be loading 69 SMK's or 77 SMK's, using Varget or H4895. Correction. 1:9 twist. Looking like 55-62 grain bullets. I would suggest considering Winchester 64gr PowerPoints. I'm planning on developing a roughly (ballistic) equivalent load to the M855 with these bullets and Varget. For my purposes, ballistically equivalent means roughly coincident POI's. I consider these bullets to provide better terminal performance, and maybe better accuracy than the 62gr government penetrator bullet. Most commercial brass is adequate, just try to avoid mixing headstamps. I use PPU brass nearly exclusively. My source is usually Prvi-Partizan/PPU 55gr FMJ ammo, available for $7.97 per box of 20 at WallyWorld. When supply and cash are in harmony, i generally pick up 5 boxes each month. For .223/5.56 primers I use either CCI BR-4's or CCI400. When duplicating a commercial load, I will sometimes also use Winchester WSR primers instead. Gonna start with 55 gr HP's and Varget. Take it from there and see how she flys. I have found that the NOS 55gr BT and 26.0gr of Varget appears to be a pretty generic load. I use this charge for all my 50-55gr bullets as an initial load. If better accuracy is needed I will adjust it for the rifle and bullet. ~ 2600 fps. 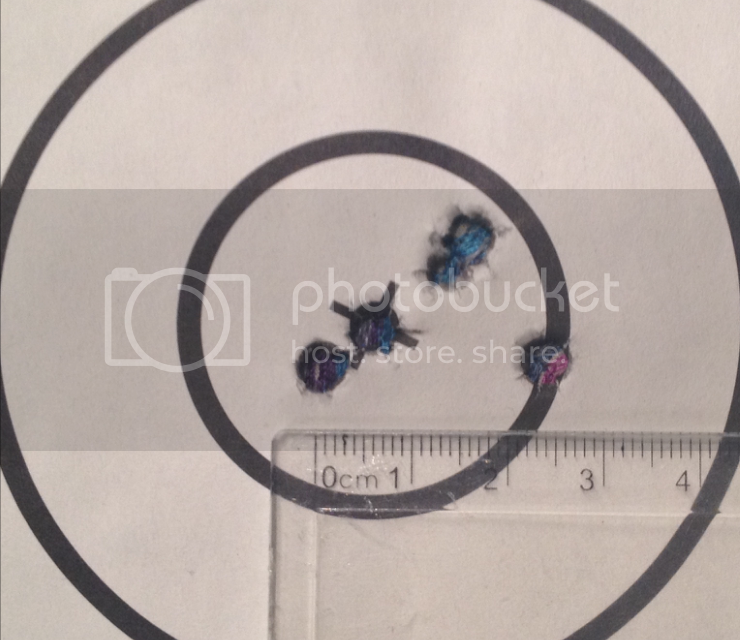 Grouping at 300 meters was within a 2" circle and shot with only a 6X scope. [HR][/HR]The wife's .223 just came back from the range. This load shot consistently well out to 885 yards in a Remington 700 5R, 1:9 twist, 24" barrel. I'll throw my two loads into the pot. The most accurate load I've found yet (which isn't saying THAT much). Was able to get 1/2 MOA out of my factory barreled Remmy (5R, 1:9). it tightened up like crazy. [HR][/HR]Here is my best so far in my AR. prints 3/8" or less groups at 100 yards. DO NOT SHOOT THIS LOAD OUT OF A SAMMI SPEC 223 CHAMBER!!! my 20 inch RRA predator pursuit. I saw where IMR4064 can be used in 223. I have plenty of that! Anybody tried that for a gas gun? If so, what's a recommended bullet weight. I'm thinking about trying 62-69 gr. BCM 16" mid length 1-7" chrome lined. 2960fps CrAzY accurate I didn't have a camera on my last range trip when I finalized this load, but 5rnd groups were easily less than a .33"
last used FC .223 cases, CCI BR4 primers, Hornady 52gr BTHP Match, 25.8gr or 26.5gr Win 748. Seated to 2.250" max, Crimped or non crimped. Both loads extremely accurate for me. I have a load for Hornady 60 grain V-Max bullets that works well in my LaRue barreled mutt AR. Two back to back 1/2" groups at 100 yards. Will load up some more to test in other 16" barreled rifles. 18" Rock Creek with rifle gas loading AR-Comp and H4895 with 77 grain SMK's crimping with lee factory crimp die. I was trilled to see the group in the center... might not look like much unless you saw the conditions and position it was fired in. All the others had the magnetospeed attached while shooting. .223 in 16.5" rem 700 w/ 1/9 twist. R-P fired brass only neck sized. [HR][/HR]Anyone tried H4895 under a 75 BTHP? I ran some yesterday in my AR with limited success, it was much faster than the 8208 and TAC loads I also tested that day. 5 rounds with a 23.5 load (mildly compressed) yielded an average of 2780, the ES was a bit high at 63, but that could have been me during the load process. Crappy electronic scale I have can vary +/- .2gr. New replacement en route. 10 shot string gave me an ES of 18 if I remember right. DaveThomas83 wrote: Anyone tried H4895 under a 75 BTHP? I ran some yesterday in my AR with limited success, it was much faster than the 8208 and TAC loads I also tested that day. 5 rounds with a 23.5 load (mildly compressed) yielded an average of 2780, the ES was a bit high at 63, but that could have been me during the load process. Crappy electronic scale I have can vary +/- .2gr. New replacement en route. I just loaded up some 75gr Hornady HPBT over H4985. Varying chages from 22.9-24.4gr. I hope to get to the range soon to confirm results. Got out today and shot 10 shot strings of H4895 under 75gr Hornady hpbt. 2.255COAL. This out of a WOA 18" suppressed AR in mid length gas system. Now to start working 23.6gr to 24.2 in .2gr increments and see what there is to see. Clearly fell off the map at 24.4gr. So I'm guessing that 22.5gr you are getting about 2640FPS?? To slow for what I'm trying to do. Prob great on brass life though. Just got my 223 bolt gun up and running. Nothing fancy just a budget build to pew with. So far its shooting 1/2-3/4 inch with the following load. I only have 21 rounds through the barrel so i have high hopes for it. Not sure on the velocity yet. Using this in my 12.5" suppressed AR. Rifle has a V7 weapon systems match barrel. Caution as this is a 5.56 pressure load. Federal brass (range pick up) bumped shoulder back 0.002- 0.004". My SD with this is 25 fps bit it ends up well under 3/4 MOA. I assume a longer barrel might help with the high SD's. Anyone load and 60gn v-max with varget? I got a good deal onow a lot of varget and want to know how well it works with the 60 gn. I measured a Hornady Superformance cartridge using that same projectile and the length was exactly the same as this workup. [HR][/HR]Did not want to do load development for 5.56 AR. Ammo: pulled M193 LC bullets off, replace with Nosler 55gr. BT'S. Gives me sub MOA groups that are one ragged hole. Use same powder charge, primer, and no other prep to brass. Seated back to mag length. Setting up for train-up prep for SW LR Nationals, MR/600yd Matches F-T/R. Granddaughter Elena and myself, 24" barrels, Stag Super Varminter, and Savage 11VT. Both use 5.56 chambers. Will load HDY 75gr HPBT-Match for single feeding, will match to short jump (<1 turn of seater stem) on each rifle, Stag will employ Satern follower. Intend to use following load with. Comments, advice, suggestions. Leaving current load on the shelf, 23.7gr Varget probably needs to be upped for 600. The 24.4gr charge keeps turning up in Internet searches associated with the 75HPBT-M. I would say do a load work up on it and check. Look at the numbers for real world accuracy not FPS speed. It's easy to get caught up in numbers instead of results. Appreciate the advice, it's pretty much the same as I would give. Thank you. But time is short and the nearest formal range is well over an hour away. I was hoping to cut to the chase. If someone can give comment on this specific load in a 24' varmint weight barrel, it would also be appreciated. Safety-wise, the load is .6gr below Hodgdon published max, so I don't think there's serious issue with that. 500pc of new Win brass is in transit, 500 HDY HPBT-M, CCI BR-4's, and Varget onhand, just need some specific advice on the specific load. WB constructing a load confirmation batch as soon as brass arrives. Maybe my last was a bit harsh, but it bites to ask for help and get that echoing silence, especially when I'm usually fairly free with help, myself. Or maybe I'm asking too much. In the absence of response, I've made up the load confirmation batch for testing, and will be firing it in both guns today, an hour from home. This after once again doing extensive searching for internet comment about the load, about similar loads, and about matters concerning chamber pressures and max charges. I will soon report on results. Does anyone have a load worked up for the 70gr. Nosler RDF's? Yesterday's outing was a busy one, mainly about learning what I had forgotten over the past year away the range. Winds were strong and gusting on the 10-20MPH range, fishtailing between 6 and 8 O'clock; so we elected to keep it within 100m. Temp was right at or around 72F, we were literally within less than 1 mile from the Mexican Border at the Douglas AZ Shooting Park. We were myself, my Wife Celia, and our Granddaughter Elena, 20. Also on the agenda were some tasks involving first time firing of Celia's S&W M&P 9 Shield, continuing practice with my Ruger American Pistol 9mm Pro, and .17cal gas operated pellet pistol. Despite the winds, the Savage 10FP delivered exceptional accuracy, with precise POI movements (pretty much 1/2 of a bullet diameter per click) corresponding exactly to the 1/8MOA POA clicks on the Mueller 8-32x44 Target Scope. I am not posting groups because the winds were significant enough to bring any serious numbers into considerable question. I will just say that the lack of dispersion was a very welcome surprise. Also, my new 10th edition of the Hornady reloading guide arrived via UPS while we were out at the range. The Varget 5.56 NATO charges listed by Hornady for the 75gr bullets are maxed at 24.6gr, then limited to 23.5gr for 223 Service rifle, and no listing for 223, which tops out at 60gr for bullets and 24.9gr of Varget. The 75gr bullets in 223 top out at 25.0(C)gr for Varget listed in the Hodgdon loading guide. This data can be confusing and contradictory, so pressure testing with the specific components and firearm is a must. Start 10% below listed max and work up with reasonable increments. Do not exceed specific published max for the specific chamber, bullet, and powder. Observing pressure signs from the fired cases, I'm going to stay with the Hornady lower max listing, the pressure signs on the brass are as significant as I would want to run, with some definite flattening and cratering, but no ejector swipes. 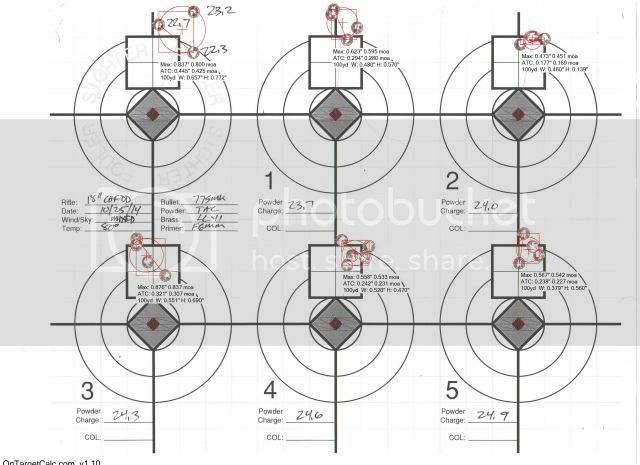 Of note is the fact that the Hornady 75gr bullet selection puts the HPBT-M bullet noticeably shorter overall and probably in bearing surface as well than the other selections, so it is possibly at a slight advantage pressure-wise over the longer bullets. The AR cycles properly with the Satern single feed follower, as modified to bevel/relieve the upper surface of the forward lip at about a 30* angle from horizontal, to a depth of about 1/8"-3/16", eliminating the BCG hangup issue. I'm not being critical about this issue because the follower needs to work with a vast multitude of magazine choices, and there can be considerable variance between them. The magazine used is a USGI 20rd ARC item. The firearms tested with the load are a Stag Model 6 Super Varminter, 24" 1:8" barrel, and the Savage 11VT .223, 24" 1:9" barrel. 24.4gr of Varget (Compressed) weighed on a Hornady Lock-n-Load automatic powder dispenser. A great powder measure, it allows loading primed cases with little to no delay between rounds. It's bang-on with the Varget in the .223 case. Pressure signs are substantial enough to strongly caution against increasing the charge at all. This is a significantly warm, probably hot, load; even at .2gr below Hornady's listed max. I'm guessing that there are hotter commercial and military loads out there, but this is as hot as I would prefer to go, and may be even hotter than that. I am only considering it at all because of the 600yd distance requirement. Velocity in the Hornady book indicates 2800fps from a 20" barrel, and our barrels are 24", so I'm conservatively estimating a 2850-ish velocity. Yes I get that. Grateful for your response. I just got back in from reorganizing our kit out in the garage. I brought the fired cases in and have examined them all in detail. The primer flattening I believed I saw initially turns out to be considerably less pronounced than my first impressions would indicate. There is still a pronounced round shoulder on the primers. Cratering is present, but absolutely no evidence of ejector swipes. There is only one anomaly, present on most of the cases fired in the Stag AR, some sooting on the case sidewalls. I'm not seeing any reason for it, and am left guessing. The rifles have both been cleaned thoroughly, as well as lubed in detail. I'm going to have to watch to see if this sooting recurs. But for the basic part, I am satisfied that this is a safe load in these two rifles, and depending on wind conditions, may also turn out to be accurate. My initial impressions are that it will be very accurate. I have a very mild suspicion that the sooting may be some sort of deposit left in the gas tube from previous use of the foaming bore cleaner. It may have dislodged some carbon accumulation from the tube. I ran a Hornady ballistic solution on the load, assuming 2850fps, and our local 4800ft altitude. It indicates 1313fps at 1000yd. That's a pleasant surprise. Following up some days later, after a some daily treks to a local abandoned mining pit about ten minutes from home, under very light wind conditions; the rifle holds the 9 ring on the MR-31 shooting prone from a very annoyingly pitched firing point. Seriously, anything leaking out of the ten ring is my marksmanship issues, not the load or equipment. The load is now finalized at 24.4gr Varget, HDY 75gr HPBT-Match 2.255" OAL, Win Brass (No Prep), and CCI BR-4 primer. While rounds out of the Stag still exhibit sooting, it comes right off in the Cleaner, and the brass shows no evidence of any damage. For now, I'm just going to live with it. Elena had similar, related marksmanship issues. Otherwise, she has quickly accommodated to the single-feed mag follower, and is otherwise getting with the program. Today we skip the range and do dry firing at home, now that we have exposed some marksmanship issues and established an actual need for coaching. Seen thus, further 100yd practice will forego single feeding as well as the 75gr handloads. From now on, we will be utilizing fully loaded 20rd magazines and PPU 55gr FMJBT, which will be recycled as once fired brass for reloading. I will be using a brass catcher to simplify retrieval. The pit faces West and has some shadows, and using 6" shoot-n-see stickup targets near perfectly duplicates the rings from the MR-31 target, as well as showing hits a whole bunch better. I think these alterations will speed up training and improve its effectiveness. This is my load for the .223 Wylde with a Benchmark 22" 1/8 twist barrel. Never loaded for .223 before, using a 7.7 twist Bartlein .223 Wylde chambered barrel in my TL3 built by PVA. I also have h4895 and Varget on hand that I use mainly in my Dasher. I use Varget, and would start at somewhere around 22gr. The Hodgdon site lists 23.7gr(C*) as max for 77gr, but the bullet brand may make a difference. I use the load mentioned below primarily because I need to accommodate a 1:9" twist barrel as well as a 1:8" one. I have no issues with OAL seating the HDY 75gr HPBT-Match, and prefer to use a 2.255" magazine length for that. Pay attention to pressures, I turned away from the 77's because there seemed to be more bearing length involved, and I was concerned it might spike the pressures. Since I only seek to reach 600yd, the HDY 75gr HPBT-Match bullet seems totally adequate, IMHO. I have a lot of respect for the shooters who go further than 600yd with the .223/5.56, but for that, I'll use the .308 or .260, if I shoot it at all. My approach to competition is about the context and the overall experience. Winning, should that occur (unlikely indeed...), is entirely coincidental and not something I intensely pursue. Thank you for the thoughtful reply Greg! For those who may be interested in the comparison between the 77gr SMK and 77gr Berger OTM tactical, I recently did load development with both bullets. Development with the SMK was done about a week before the Bergers but another string of 23.5gr to 24.5gr was done on the same day as the Bergers to reconfirm everything and the velocities matched up from the first test +/- a few FPS. For both work ups the same WCC 11 cases, same lot of Varget and Tula KVB-223 primers were used. Both set to the same OAL with the same amount of crimp from a Lee crimp die. All charges were thrown from a dispenser and fine tuned on an A&D fx-120i. Velocities were measured over a Magnetospeed V3. These were all from the same 18" Ballistic Advantage 223 Wylde SPR barrel. Please keep in mind that these are my loads from my rifle with certain lots of components and type of brass. Caution should always be used and loads should be started a few grains below the manufacturers book max. Velocity pretty much flat lined after 24gr. I loaded up a 5 shot strings of the 23.9gr-24.5gr charges and 24.1gr had the best ES/SD at 14/7.3. I also loaded up 24.6gr, 24.7gr, and 24.8gr but didn't write down the velocities, this was mainly to try to find pressure signs. None were seen in my barrel. I loaded up several hundred rounds at 24.1gr and it shoots very well and are averaging 2605fps for 5 shots. Accuracy with this load is sub 3/4moa for 10 shot groups. The Bergers had much flatter nodes than the Sierras did. Pressure was never seen on this string either. I loaded several 5 shots strings of 24.3gr-24.5gr and they were all very consistent. I decided on 24.4gr as it was right in the middle of the node. Of the 5x 5 shot strings I loaded, all were no more than 10fps ES wish is astonishing to me in a gas gun. They are averaging 2626fps and shoot little knots at 100 yards. I ran both loads this weekend in a PRS DMR competition with shots out to 680yd and they were all consistent. The furthest I shot the Sierras was just shy of 600 and they worked well but the Bergers were much more consistent at distance. Both loads shoot to exactly the same POI at 100 but the Sierras take another .1mil to get to the same distances as the Bergers. This is due to the slightly higher velocity of the Berger load. Approximately 200-210 rounds of the Bergers and 150ish rounds of the SMK's were shot during the two days in the rain, heat and dust with zero weapon maintenance and both were 100% reliable with no pressure issues, no popped primers. I did have one shot from a SMK that was definitely tossed about 2mils left at 470yd for some reason other than wind or shooter movement. I attributed it to dry tumbling after chamfering to remove case lube and brass shaving and figured a case mouth probably got dinged enough in the tumbler to shave the jacket when seating and I just didn't notice. All in all both are very solid and the velocities are very close for charge weight, but in my rifle the Berger ended up with a node a little higher and also didn't flatline. The accuracy as well as ES/SD was much better with the Berger. I'll burn up the rest of the Sierras that I have loaded for it, but the Bergers are what I'll be buying more of. More velocity can be had with other primers but I find this powder to be the most consistent and accurate for 77gr bullets. A lot has happened since 2017 for me. The load testing for Elena and myself was in anticipation of the 2017 Berger SW LR Regionals at Ben Avery Range just outside Phoenix, AZ. I competed in the first stage of the 600yd MR matches, but retired before the 2nd and 3rd ones, due to heart/lung related health issues/discomfort. Two months later, I had my second (since 2004) Heart Attack, and have effectively retired from high level comp. Elena did well enough to consider doing it again, but not this year. Elena now has the original 24" Stag Model 6 Super Varminter, and I built myself another virtually identical (different Optics) one from the Stag Model 6 Kit, which entire model was superceded a week after delivery by the Stag 15 Varminter, which differs in the buttstock provided, and the rather inconspicuous absence of the prior 1/2MOA (with factory match ammo) accuracy guarantee. 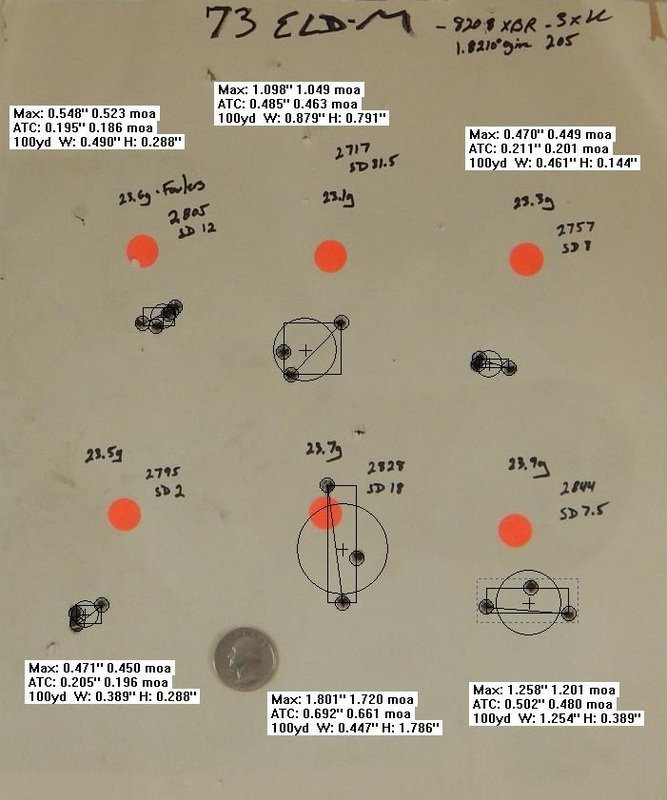 Testing of the 24.4gr Varget/HDY 75gr HPBT load from a rest and bench at 300yd (rather than 100yd prone) disclosed a lack of accuracy that was not apparent at the shorter distance. Both rifles (Savage 11VT and Stag 6) held the 9-Ring or better at Phoenix, but clearly, load redevelopment was advisable. I tested .3gr increments from 23.5gr to 24.6gr of Varget just prior to my Winter layoff, and will resume very soon; narrowing the testing between 23.5gr and 23.7gr, with some IMI 77 Razor Core and Frontier 75gr Match for comparison. If the factory match loads shoot a consistent 3/4MOA or better from my Stag, I'm done testing, and will simply buy the factory stuff instead. But I have a hunch the handloads will be as close to 1/2MOA as I could ever want, and the earlier testing approached that rather closely at 100yd. The final load just needs to be determined. Soon, we will have our answers. Meanwhile, my shooting Buddy got himself rather seriously injured in a motorcycle accident Jan 9 with a badly mauled left shoulder, a fractured C-1 Vertebra, a cracked Sternum, and some cracked Ribs. He was trying to avoid running over a harebrained pedestrian. He missed the Mental Giant completely, but has no memory beyond leaving the pavement. His one year old Harley Trike was totaled. He is recovering well but slowly, is definitely not a happy camper with that neck brace, and will be out of action for some significant time to come. I am also now down my pair of 16" Uppers This has changed, they turned up in a final desperation search of the entire shop/gun cabinet setup., and will take delivery of a very basic replacement AR Stoner 16" 1:7" Upper from Midway today (backtracking the product listing, it looks like I may have caught the last one...). All I'm really looking for is something I can do some significant carry with. Tomorrow the Bushnell AR 223 Drop Zone 3-12x40 side focus BDC scope and Nikon P-Series mounts arrive from Amazon. The new upper's 1:7" twist may handle the heavies; and if so, that's also a bit of a relief. But I'll also be testing the Fed Fusion MSR 62gr Bonded factory load, the earlier 64gr Win PowerPoint Varget loads, as well as a 65gr SGK/SBT Varget handload in it as well. I also had my automatic powder measure go belly up yesterday, and an RCBS automated powder dispenser also arrives tomorrow. FYI, I will never own another scale/dispenser with a membrane switch user interface again. The work's cut out, all that remains is the testing. PS, The AR Stoner 16", 1:7" Upper is in, and it looks beautiful. This load shows no major signs of pressure. The case-head is unmarked and the primer is flat, but not cratered. Though, with how compressed this load is, I dont believe I will be pushing it any more than this. This load gave me an SD of 13.0 over 10 shots, and if I back down to 25.8gr I see an SD of 7.8 and a MV of 2874fps. I have or had 15+ WOA 1:7 barrels. A lot of bullets shot great but nothing shot better than 77smk over 8208XBR. Always in the 23.4 - 23.6 range. That looks fantastic. I have a 500 box of 77gr SMK sitting on the self. I will give them a try. As long as I can load them to 2.25 COAL (magazine length) and get consistent sub .75 MOA performance I would be thrilled. I can get semi consistant 1 MOA from just about anything this side of AE FMJ or PPU. Its when you shrink the expectation by 25% and want it every time that things get challenging and so-so loads and factory Match usually far by the way side. Thanks again! I have a Daniel Defense 16" barrel in 1:7 twist. I know it is not a match barrel/gun but looking to get what I can out of it. 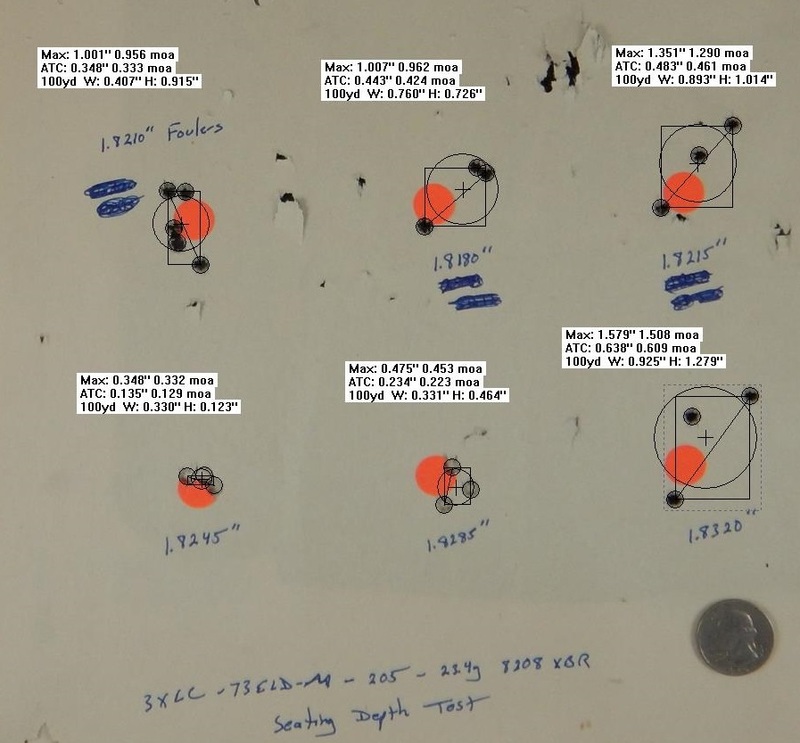 I bought the Tipped SMK 77 gr bullets and wanting to find a load 600 yds or so. I am used to loading for custom bolt guns capable of sub .25 to .5 MOA. Just learning to load for the gas gun. Have loaded many rounds for it but not really to see what it can do longer range. Any suggestions for powders for this. I use CCI BR-4 primers and Lake City brass. Also, how do I know if the gas is right for this loading. Again not real confident in gas guns. I think it is a mid-length gas. It has a free-floating handguard. Thanks for your help! With the 77 TMK's you will have to load them longer than AR mag length, I think you are going to want to get some regular 77 SMKs or try the 73 ELD-M's which are designed to be loaded to mag length. Sierra has enhanced a segment of the MatchKing line by adding the acetal resin tip, thus crowning the Tipped MatchKing (TMK) bullet line. The major advantage of adding a tip to the bullet is the reduction of drag, producing a more favorable ballistic coefficient. Another benefit is reliable feeding in magazine fed firearms. The 77 grain Tipped MatchKing (TMK) allows seating to an OAL that permits cartridges to be loaded into M16/AR15 magazines. I loaded them and at mag length and they shot pretty well without any load development. Looking to see what powder people are having best luck with to start with. I know I will have to do my own load development but want 2 or 3 powders to start with. Thanks. I have been having pretty damn good results with 25.5gr of 8208 using the 52gr Berger FB Target bullets. What charge weight are you suggesting for 77gr pills (TMK or SMK) ?